PHOENIX — When it comes to choosing a “how-to” outdoor skill event, one size does not fit all. So, where does one begin? Look no further than the Arizona Game and Fish Department, along with its extensive network of partnering organizations, which offers dozens of events throughout the year to suit almost everyone’s needs through the Outdoor Skills Network. Introductory: No hunting or pursuit of wildlife, shooting lessons, instructional, typically one-day activity. Introductory – knowledge or information imparted. Beginner: Basic take of wildlife, one-day event, pass shooting, species include dove, ducks, squirrel. Beginner – a person who is inexperienced, novice, a person who has begun a course of instruction or is learning the fundamentals. Developing: Pursuit of wildlife, overnight events, remote locations, species include quail, rabbit, predators, javelina, turkey. Developing – one who is learning by practical experience under skilled workers of a trade, art or calling. Intermediate: Pursuit of more challenging species, deer, elk, stalking, remote locations, overnight, a lot of field time. Intermediate – applies some already learned basic skills to adapt and meet the next level of learning, skill development. Experienced: Coming soon, minimal mentoring, base camps and “meet-ups.” Experienced – having knowledge or skill in a particular field, especially a profession or job, gained over a period of time. “We are really excited with this new format,” said Doug Burt, the department’s hunting and shooting sports program manager. “We hope it’s better for the customer to find what’s right for them. The new format can be found on pages 24-29 of the “2017-18 Arizona Hunting Regulations” and by visiting www.azgfd.gov/OutdoorSkills. In an ongoing effort to better serve the public, the department recently launched a new online registration system. It’s a winning combination that’s customer-focused and mobile-friendly, as well as a time-saver. Of course, event types and descriptions are merely guidelines. 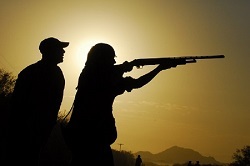 Most events offer activities that are suitable for all skill levels, from hunting, fishing and shooting to learning more about wildlife, habitat and conservation. There is no cost to Arizona taxpayers for this program. Game and Fish does not receive any of the state’s general tax funds and operates under a user-pay, public-benefit model. The program is an investment in the continuance of wildlife conservation efforts and outdoors recreation participation in Arizona. To learn more about how hunters, anglers, shooters and boaters fund wildlife conservation, visit www.azgfd.gov/h_f/federal-aid-cycle.shtml. Copyright © 2019, Arizona Game and Fish Department. All rights reserved.